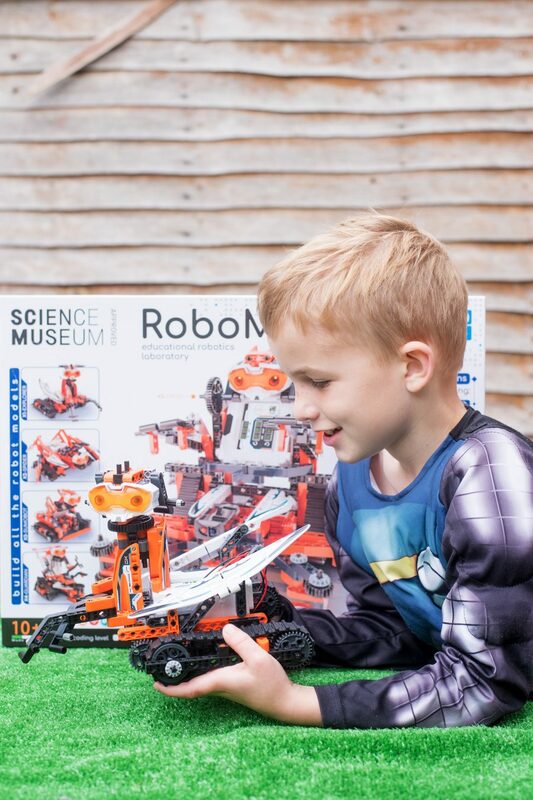 All of our boys love robots – and as their daddy is a software engineer, I welcome anything in the toy review world that’s to do with coding and computers as I know they’ll be able to have fun without my lack of knowledge in that area holding them back if they get stuck. 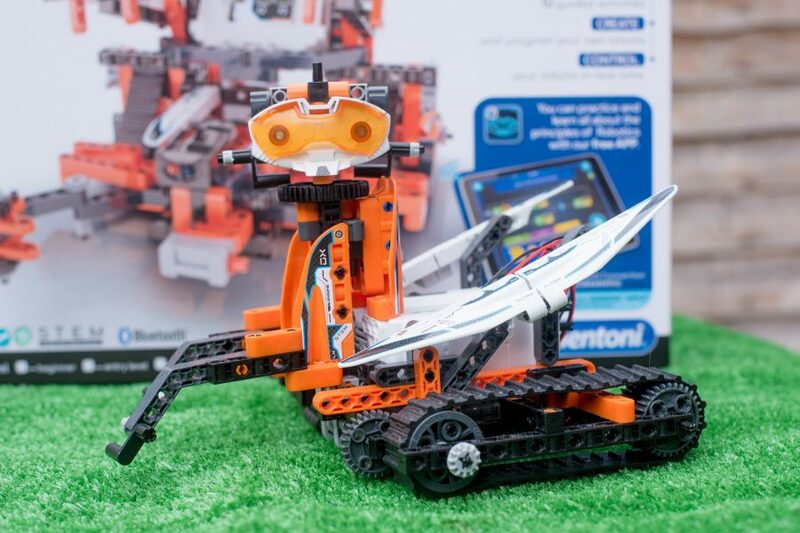 The Clementoni RoboMaker Pro is a robot making kit aimed at ages 10+ which is designed to introduce children you to robotics and coding. 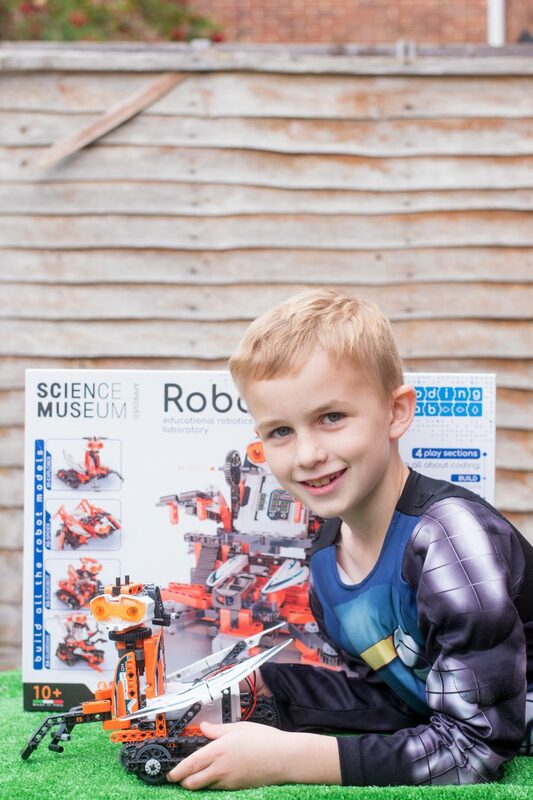 Jens has been a very capable little guy when it comes to robotics so far and has already built himself an R2D2 with the Little Bits Kit last Christmas, and so even though he’s only 8, both his Daddy and I agreed that this would be a great challenge for him. 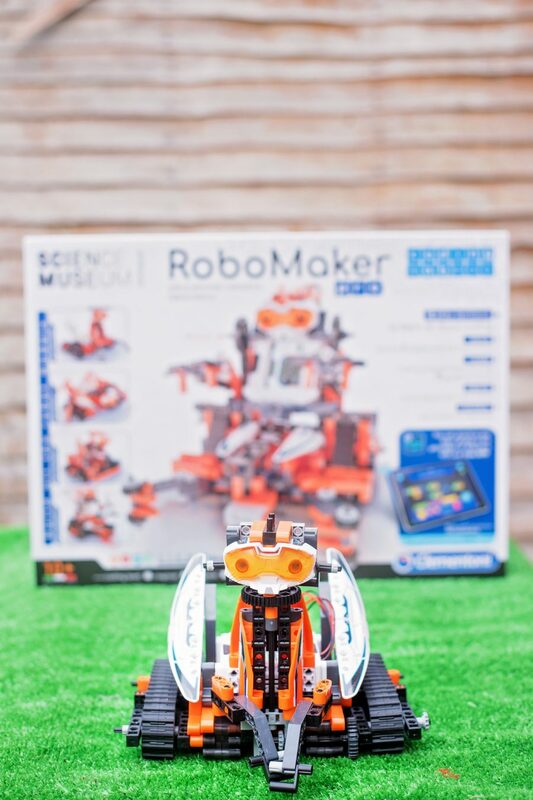 The Clementoni RobotMaker Pro is made up of four different play sections – BUILD, LEARN, CREATE, and CONTROL. In BUILD, you learn how to build five different types of intelligent robots with full instructions through the free app, and in LEARN how to program them through 10 guided activities. 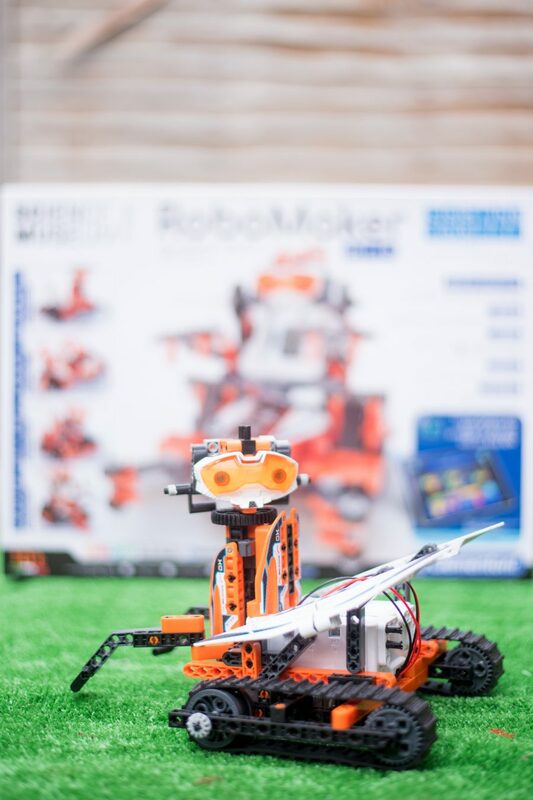 Then comes CREATE where you make and program your own robots [there are five increasing in difficulty] and then bring the incredibly intelligent robot you’ve created to life, to CONTROL in real time by coding! Jensen was beside himself [and so was Gav] when we opened the box. It’s HUUUUGE. As soon as I see robots I think of Johnny 5 from Short Circuit. If you’re like Jensen, you have no idea who I’m talking about and he gets annoyed every time I yell, “Johnny 5 is ALIVE!” around him. I’m turning into that annoying mom apparently. Anyhow, I left the boys and Daddy to it and headed out shopping with my niece who has incidentally just moved from the Midlands down here to Southampton to start her degree in CODING. Woo hoo! A couple of hours later, I came back from shopping and Johnny-5 was alive in my living room and zooming about the floor in the cutest manner. As I mentioned above, there are five possibilities for building robots with the kit and so Jensen and Daddy started with the simplest, the X1 Explorer [Johnny-5 to you and I] This one has a little motor and lets its creators program movement, speed and sound effects in. Just look at his little face below. The price! Around £69.99 makes this the best value toy that I’ve seen for this kind of activity. I’d snap it up for Christmas for sure. Honestly, it’s a fantastic set. That the RoboMaker produces very sturdy little robots – nothing falls off the X1 when he’s picked up, which is a huge difference to the Little Bits R2-D2 casing which Jensen gives me evil stares for when I dust him. 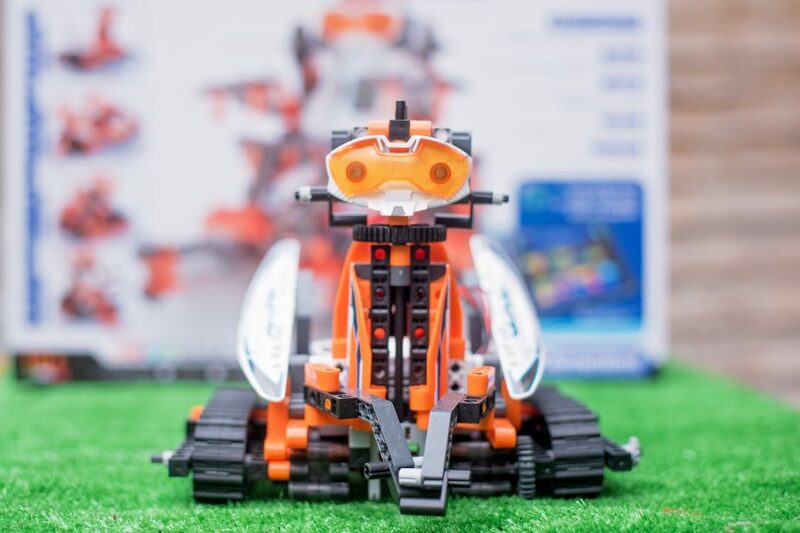 How amazing the X1 Explorer really is – there’s so much to do and this is the simplest robot! The app which introduces children to coding in a which makes sense. Jensen took to it instantly and although it’s not quite like grown up coding [apparently – what would I know?] it has enough challenge to help children start to understand how it all works. 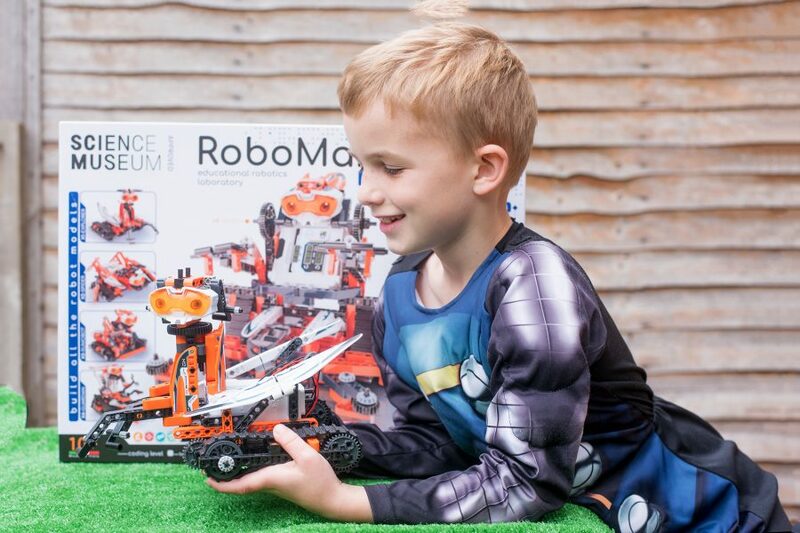 That the RoboMaker is fantastic set for letting parents spending quality time with our not-so-little-little-people without it being too boring or too ‘babyish’. This is a very cool project and takes quite some time to build each robot. It’s a brilliant bonding toy. That the set increases in difficulty and presents a challenge – the set will last quite some time as Jens progresses through the different models and learns as he goes. That the RoboMaker has really made the boys excited about coding. There is NOTHING like having your own little robot friend. They can see a purpose in coding. The set was quite brilliant – our only one wish was that when popping some of the little plastic components out, some of them had burrs left on them and needed to be smoothed out. We wish they felt a little less annoyingly snaggy. The Clementoni RoboMaker Pro was sent to us to play with for the purposes of this review. Our views are honest and our own.